Gator Gulp is a really cute and fun frame game right out of the Everglades! 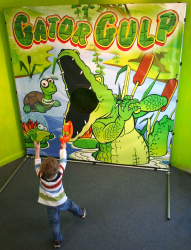 Kids love flipping the baby turtles into the gator's hungry mouth! It's colorful and whimsical. Price: $70.00 per 5 / hrs.